1. 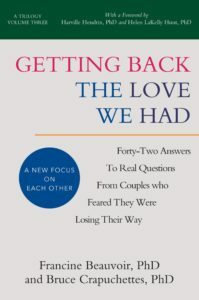 Our Book: "GETTING BACK THE LOVE WE HAD"
2. Our Book: "An Imago Clinical Handbook"
3. Francine’s Book: "Raising Cooperative & Self-Confident Children"
Forty-Two Answers To Real Questions From Couples Who Feared They Were Losing Their Way"
The trilogy has the same main title and sub-title for each volume. Each has a different sub-sub-title. Volumes 1, 2, and 3 may each be purchased in paper back or as an eBook (Kindle). The trilogy includes 126 Q&A’s in all. Harville Hendrix and Helen LaKelly Hunt write the over all Foreword and a chapter in Volume 2. The paperback is $12.95 and the Kindle is $6:95. Do you wonder, as many of us do, how your love story that had such an amazing beginning can have eroded and brought you pain and tears. "We were on a mountain top. We REALLY loved each other. We were and still are committed, and yet our love has not fulfilled its promise." If your dreams are slowly crumbling, we invite you on a journey, which we hope, will provide some answers. 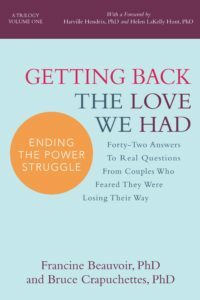 The bulk of these three volumes is made of our responses to real life questions asked by real couples searching for a deeper understanding in their own life. Maybe you have, like us, tried to change your partner. You may have a long wish list, and with it a trail of tears, because it mostly has not worked. You may feel at the end of your rope, yearning for some greater understanding. If so, these volumes are for you. While no single answer will meet all of your needs, we invite you to keep reading. Each new answer will fill in another part of this large puzzle. We invite you to go on a reading adventure, one that, we hope, will guide your thinking, and help restore the dream you once had. Over the course of twenty-two years of training licensed psychotherapist to become Imago therapist, we have gathered 300 clinical questions posed by our students. We have now categorized and published our answers to all these questions. While this book is primarily designed for therapists, some non-professionals have reported enjoying reading it. We have bound the book in large spiral binding so that the book lays flat when opened for easy use. "We are impressed that Bruce and Francine kept 22 years of Imago clinical questions during their trainings and have now taken the time to answer and classify them for students of Imago therapy. This handbook contains the wisdom of 26 years of Imago practice both personally and professionally. It will be an essential adjunct and a valuable guide to all practitioners of Imago Relationship Therapy. It clearly lays out their vision of what Imago work looks like. “AN IMAGO CLINICAL HANDBOOK” is a must for your Imago library." 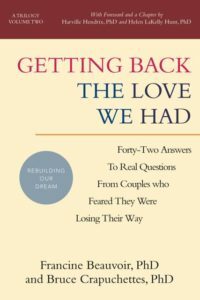 - HARVILLE HENDRIX, PhD and HELEN LaKELLY HUNT, PhD Authors of the New York Times best seller, “Getting The Love You Want: A Guide For Couples” And many more best sellers for singles, parents and marriage. "Bruce and Francine draw from years of experience, harnessing the power of the Imago dialogical processes. Beautifully and thoughtfully articulated, this book identifies the brilliance within the simplicity of the Imago theory and practice, the relational paradigm, and the importance of structure in breaking symbiosis and moving toward differentiated connection. With emphasis on Imago’s broad comprehensive usefulness, these amazing questions offer a wonderful resource for both new and seasoned Imago Therapists." - MAYA KOLLMAN, M.A., is one of five certified Master Trainers in Imago Relationship Therapy. She is also a former Professor at Rutgers University, and currently maintains a private practice in New Jersey. She is sought worldwide for training, supervision and lectures. The price of the book is $28 including $3 for shipping within the US and is paid by credit card thru PayPal. Please note that you do not need a PayPal account to pay by credit or debit card. A very practical manual for parents to learn how to engage in dialogical parenting. It provides tools, such as the "round table" which take parents beyond common forms of discipline such as "time-out." It provides many illustrations of how to relate to your children in common situations. "Francine Beauvoir, Ph.D. has created the best guide for working with parents that I have seen. It is an excellent guide to using dialogue to create and sustain a connection between parents and children which will prevent wounding. It helps parents put Imago principles into action." This is the New York Times best seller, that in 1988, thrust Harville Hendrix onto the national stage, gave him 17 appearances on the Oprah Winfrey Show, founded the new couples therapy, Imago Relationship Therapy and founded the Imago International Institute. 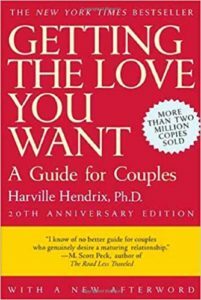 In Getting the Love You Want: A Guide For Couples, Dr. Harville Hendrix presents the relationship skills that have already helped hundreds of thousands of couples to replace confrontation and criticism with a healing process of mutual growth and support. This practical guide describes the revolutionary technique of Imago Relationship Therapy to take you on a journey from reactivity to attaining a “conscious relationship”. To make a payment by credit/debit card via PayPal enter the amount and click the Pay Now button.